During solidification form the melt, metal crystals or crystal aggregates (e.g. eutectic grains) can take on different forms. The description of the structure of growing crystals is performed by solidification morphology. Basic relations between solidification morphology and casting properties have been worked out so that reliable conclusions regarding its casting behavior in practice can be drawn if the solidification behavior of an alloy is known. Crystals can build up on the mold wall (exogenous) or inside the melt and/or be transported there (endogenous). In case of further growth, either they remain compact or they branch (dendrites development). Exogenously created crystallites grow elongatedly in melt direction due to the thermal flow directed to the molding wall. From a macroscopic point of view, a batch of crystallographically similiarly oriented, parallel dendrite axes represents a columnar crystal which can be made visibile during a cast structure macro-etching. Due to the nondirectional solidification heat runoff in the melt, endogenously created crystallites in the melt become round grains (globulites) (Fig. 1). (See also Directional solidification (Nondirectional solidification). Two typical solidification types can be defined for classifying existing solidification processes (see Solidification type). There are transition types between the solidification types described therein. A casting material may run through several solidification types during solidification. Especially in case of under-eutectic alloys, primary crystallization and the following eutectic crystallization according to to Fig. 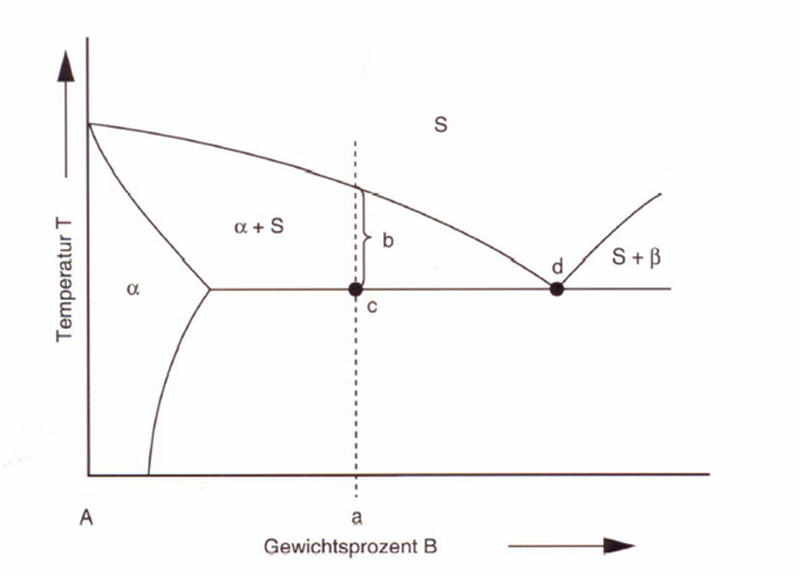 2 generall can be assigned to different solidification types. Pure metals solidify smooth-surfaced. An alloy content increase shift the solidification from the rough-surfaced type to the sponge or papescent type. An increase in the cooling speed may shift a sponge-like solidification to a rough-surfaced solidification or a rough-surfaced solidification to a smooth-surfaced solidification. In case of endogenoussolidification types, a faster cooling results in increased scaling. Vaccination and grain-refinement treatments predominantly result in endogenoussolidification. A fine grained mush builds up during solidification.